Check out the pictures that are coming in from the good folks in the Peanut Gallery! Our wonderful photographer has chosen a few of our pictures for his web site! Well, the date has come and gone. We are over due in getting you all an update, but as you can imagine, things have been a little busy. The good news is that no one was seriously injured, everyone has been released from the hospital, most everyone is out on bond or OR and everyone is accounted for except Sancho. Those of us who know Sancho don't really find this of concern. He was last seen dancing his way down Broadway with a bottle of scotch and two good looking babes so I don't think we need to worry about him. 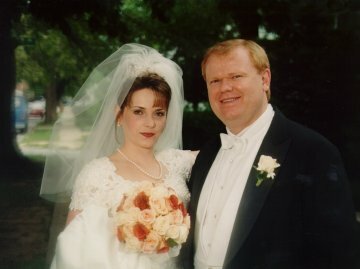 Until we can find out exactly what happened and get it posted here, you all will have to make due with a simple picture of the bride and groom. Yes I know the sampling is bad but I'm working with limited equipment. When I get back to the Comm Center I'll get you a better scan. 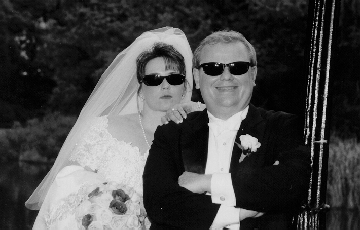 For those of you who can live with it, how about the bride and groom with a little attitude! Have a Great Day and I hope to have more for you soon! This page is dedicated to news and updates about our upcoming wedding. Metronome Restaurant on Broadway and 21st in New York City. The wedding and reception will be held in two different places. The wedding will be at Holy Trinity Evangelical Lutheran Church in Bellerose NY. 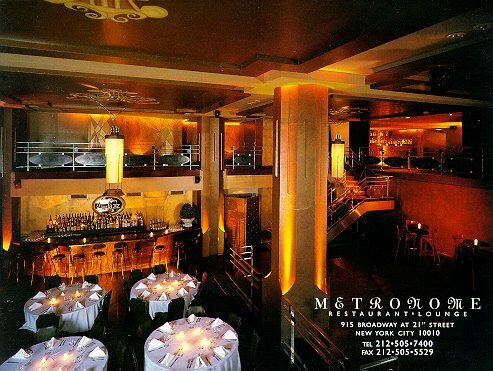 The reception will be at Metronomes in the city. The wedding is at 3:00 and the reception starts 5:00. This will give you plenty of time to go back to your room and freshen up before the reception if you desire Transportation will be available between the church and reception. The reception will be black tie optional, which means over half the gentlemen will be in tuxedos. For out of towners a local tux shop will be available so that you can send your measurements and have a suit waiting on your arrival. We have not picked a hotel yet but a couple will be chosen shortly. As for airline tickets, now is a good time to book ahead! American Airlines is the offical airlines for the Hunt/Turner Wedding. Because of this you can get a special discount of 5% off the best rate by telling you are coming to the wedding. They offer an additional 5% off if you book your ticket 60 days in advance. American is quoting around $300 round trip from LAX to JFK. Most of my family is on American and a few of the gang have also chosen them. This will give you a point of reference for when you talk with your favorite carrier. There is a large contingent of people traveling from out of town so we have set up a mail list for all of them to communicate with each other. In addition, various details of the event will also be broadcast over this list. If you are planing on attending then you definitely want to subscribe to this list. To subscribe, follow this link.